Once a decision has been made by the appropriate government authorities to embark on a nuclear reactor regulatory program, it becomes necessary to build a regulatory program that establishes requirements needed to ensure nuclear power plants operate in a safe and secure manner. These requirements need to ensure that public health and safety are protected and plant operations are consistent with internationally accepted nuclear safety standards, security guidelines, and safeguards requirements. Requirements for decommissioning and for management of radioactive waste and spent fuel also need to be developed. Development of a mission statement to reflect the agency’s purpose is desirable. The establishment of a reactor regulatory program takes government commitment to provide financing, legal foundation, leadership, staffing, agency independence, and openness to the public. Formation of a nuclear reactor regulatory program in a country where one is not currently in existence will take a substantial amount of time before it becomes functional. In the case of establishing a nuclear power infrastructure, IAEA experience suggests the time from the initial policy decision to plant operation can take from 10 – 15 years, and an overall commitment of at least 100 years is necessary to complete the overall fuel cycle including waste disposal . Dependence on IAEA and other countries that have developed programs will be needed, and a commitment to obtain this help is a necessary component of initial efforts to get a program started. For those countries who have already started to develop a program or who desire to broaden the scope of regulatory activities, this document will be of assistance in those efforts. Many countries have established agencies to regulate other activities, such as medical uses of radioactive materials, and can utilize this experience to help modify the structure of an existing agency with similar functions. Reference 3 presents a detailed discussion of actions and resource needs for undertaking development of nuclear power from the very beginning. Reference 7 identifies the steps that lead from planning through operations of a nuclear power plant and can be used to determine the status of overall infrastructure development. Reference 6 covers development of the legal framework for establishing a regulatory body and other actions to achieve effective regulatory control of facilities and activities. Should the government be in the position of both regulator and operator, care would be needed to ensure independence between the regulatory and operational functions. Any regulatory program responsibilities for reliability of operations should be carefully reviewed to ensure that these responsibilities will not compromise safety. 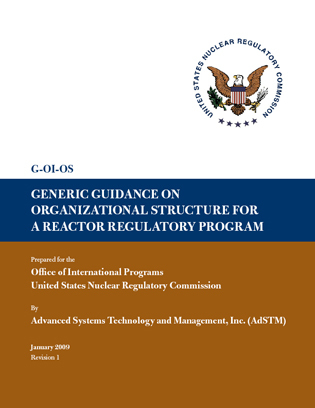 As stated in Reference 1, “…legislation should provide for an effective separation between the functions of the regulatory body, and those of any other body or organization concerned with the promotion or utilization of nuclear energy.” This document only addresses the organizational structure of the regulatory body.